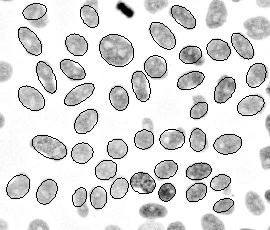 The aim of this semester project was to combine the Ovuscule (developed at the EPFL) with a Particle Filter to track cells on a image sequence. The sequences are composed of multiple cells with different shapes and different brightness. The goal was to be able to track all cells of a defined region and detect cell division and new cells entering the observed area. An algorithm was developed including a simple detection of cells. The Particle Filter is the heart of the algorithm and takes also the speed into account. Additionally a detection of cell division was implemented so that the algorithm is capable to track cells over a long time. It assigns new trackers to emerging cells and cells entering the area automatically.